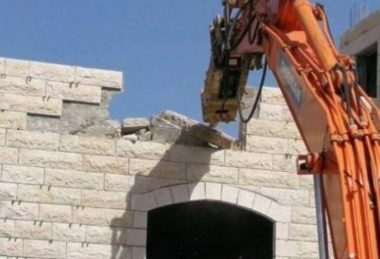 The Israeli “City Council” in occupied East Jerusalem issued, Wednesday, demolition orders targeting several homes in the al-‘Isawiya town, in the heart of the city. Raed Abu Mayyala, a member of the Follow-Up Committee in al-‘Isawiya, said dozens of soldiers, accompanied by members of the City Council, invaded the town, before breaking into many homes and buildings. He added that the soldiers handed several Palestinians the demolition orders and summoned many of them for interrogation. The Israeli authorities are claiming that the buildings were constructed without permits from the City council. While Israel continues to build and expands its illegal, segregated colonies, the Palestinians are constantly denied construction permits, and even the few who receive them end up paying large amounts just for the paperwork, in addition to the already high fees imposed on the permit applications.